I had planned to stop blogging about museums after 2016. 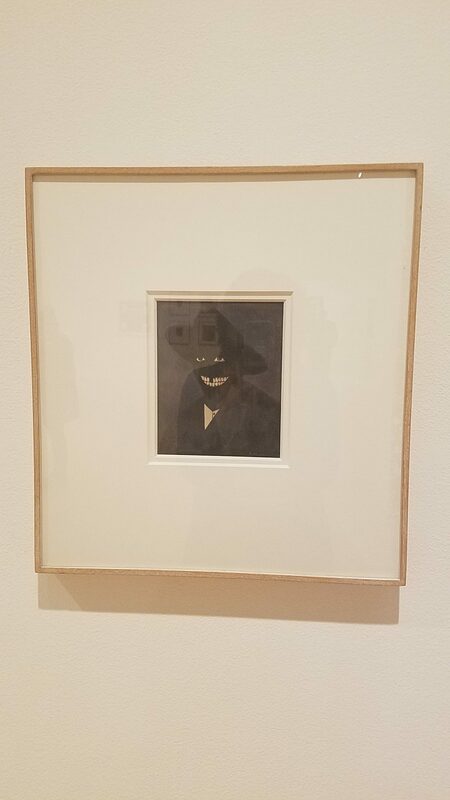 But when I went to see Kerry James Marshall’s Mastry, I was inspired to write. I first heard of Kerry James Marshall at the 2016 Association for African-American Museums Conference in Riverside, California where I met Amina Dickerson, a quasi-celebrity in the world of African-American museums. When she found out I live in LA, she told me to keep an eye out for Marshall’s exhibition at MOCA, and she even knew the opening date off the top of her head. 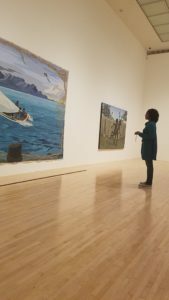 My husband and I visited the exhibit the Friday after it opened, and we were surprised by the scope and diversity of Marshall’s work. 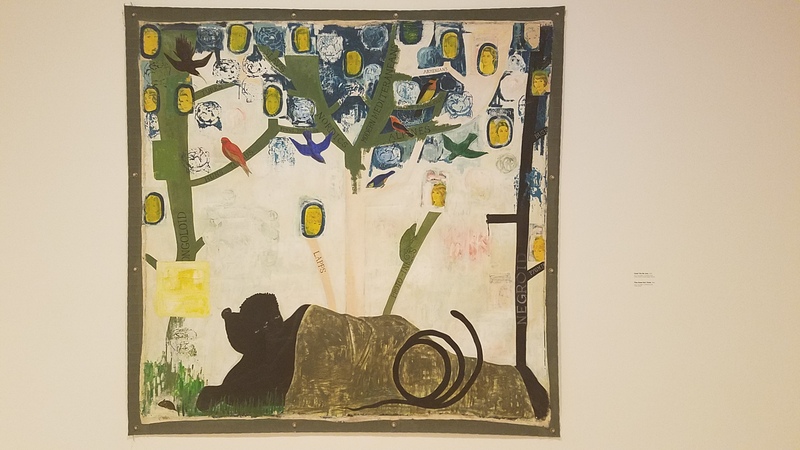 The earliest work in the exhibit, “A Portrait of the Artist as a Shadow of his Former Self” is from 1980, and while most of the works are large paintings, many include some element of collage, and there is even a photographic piece. 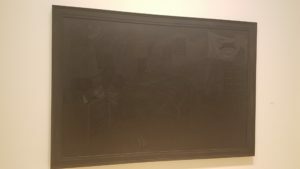 We probably spent the longest time standing in front of “They Know that I Know,” a painting of a couple lying under three trees labeled with the traditional racial distinctions of “Negroid,” “Mongoloid,” and the central one, presumably, “Caucasoid,” has been painted over (or is fading) to match the painting’s white background. Photographic images of white female faces appear to be growing or blooming from the branches, which are labeled with ethnic or cultural groups that fit within each racial group. The symbols in this piece clearly allude to Adam and Eve and the tree of knowledge. We noticed recurring depictions of birds, serpents, red crosses, hearts, and religious imagery in many of his pieces from this time period. I also spent some time in the room dedicated to his works depicting public housing developments and some of their residents. I heard an NPR story about the exhibit some days later, which focused on these pieces. The reporter, Susan Stamberg, noted how these paintings depict joy and celebration in a setting that is often associated with tragedy and despair. 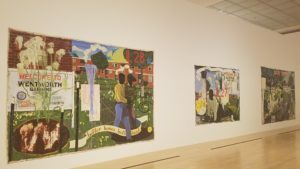 Marshall, who once lived in public housing, stressed that the paintings are intended to depict something other than those negative stereotypes. Stamberg asked about one painting in particular, which had drawn my attention too. She asked about the central figure, a man, reclining in the grass with the housing development in the background. I, too, wondered who he was and what he was thinking and feeling. According to the story, Marshall’s intent was that we see him as content. The piece we agreed was our favorite in the exhibition was “Black Painting” in which Marshall uses predominantly black with varying shades of grey and silver paint subtly outlining items in a dark bedroom including a Black Panther flag, jewelry and watches hanging on a black power fist jewelry display stand, and the books If They Come in the Morning: Voices of Resistance by Angela Davis stacked atop The Spook Who Sat by the Door share the nightstand with a miniature pyramid. According to many sources, this painting depicts the bedroom of Black Panther Party leader, Fred Hampton, just before he was shot by Chicago police while sleeping next to his pregnant wife in 1969. 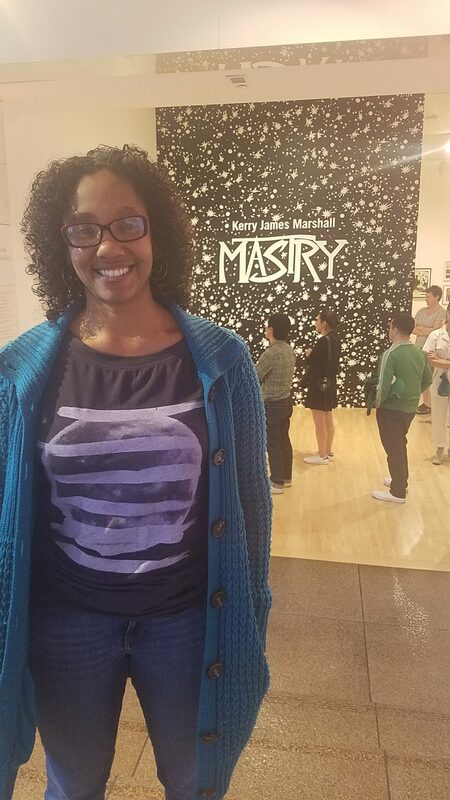 Mastry is at MOCA through July 3, 2017, and I plan to go back. 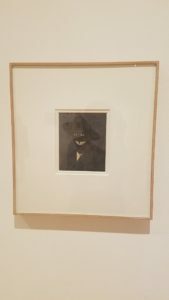 The seventy-two-piece exhibition is rich with material, so on a second visit I will see things I missed the first time.